Editor’s note–Chuck Caplinger, a leader in the 29 Palms arts scene, recently published his life story. 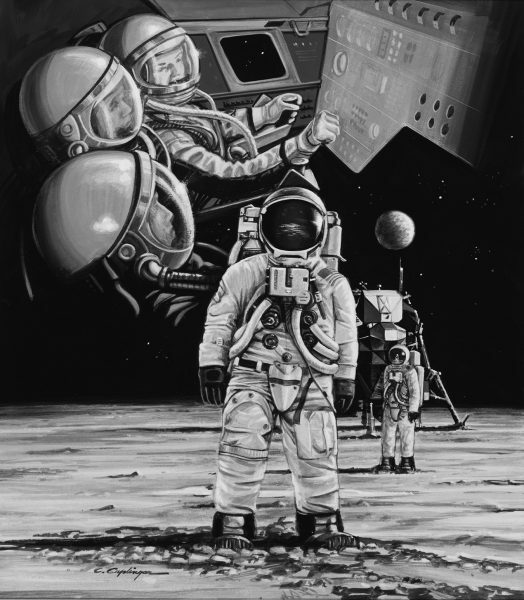 An Artist’s Journey: Memoirs of the Creative Life of Artist Chuck Caplinger follows Chuck from his childhood in Pasadena, Texas, through his tenure as a NASA artist, then on to painting custom vans and film posters in Hollywood. 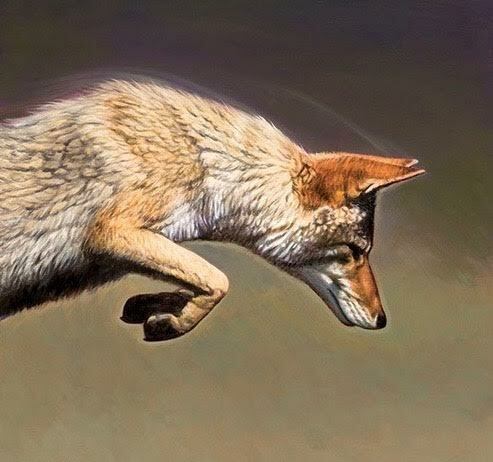 It culminates in the momentous Harley ride that led him to Twentynine Palms and his current incarnation as a desert and wildlife painter. 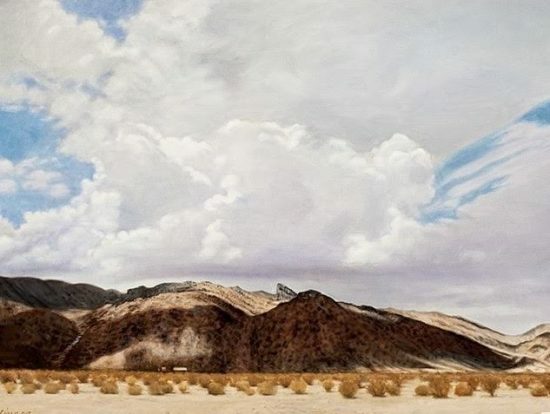 In the chapter excerpted here, the artist nicknamed Cowboy is commissioned to paint a Desert Storm Victory Parade mural in 29 Palms. The job becomes his introduction to the small town where he’ll later settle in a dome home with his wife, Holgie, transforming the local arts community with his generous presence. IN THE SPRING OF 1995, Holgie flew home from New York, and we registered to ride the Harley on the annual Laughlin River Run, 280 miles east of LA. Bikers from all across the country converged on Laughlin, Nevada, nearly 20,000 strong, all ready for a weekend of fun and games. On the morning we took off, the weather was still a little chilly, but we were wearing our leathers. For years I’d ridden in all sorts of weather, and on this day there were no high winds, so we were fairly comfortable. It was a beautiful ride to Laughlin, and after checking into our hotel, we immediately went to some of the organized events. 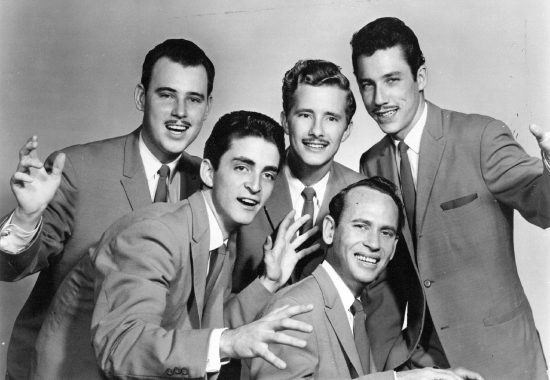 In the 1950s, Chuck (far right) performed with the Commander quartet. Over the next few days we gambled conservatively, stood in line for mediocre dinner buffets, and took rides to the neighboring communities of Bullhead City and Mesquite Creek. There were miles and miles of showy expensive motorcycles, bearded guys, and scantily-clad biker chicks. As a rule, Holgie and I avoided large crowds, but here, the feeling of brotherhood prevailed. Early Sunday morning we headed back toward LA, satisfied for having participated. Reminiscent of the name “Honda Hoss,” the big Harley had taken on the name of just plain “Hoss,” for the motorcycle had the same qualities of being able to “walk it along,” so to speak, at a speed of five miles an hour, or race along at top speed. It truly felt like riding an iron horse. We took a different route back from Laughlin that was more picturesque, and after 154 miles of riding, we reached the Hi-Desert community of Twentynine Palms. It boasted a population of around 14,000 according to the marker at the edge of town. From Adobe Road we turned west on Twentynine Palms Highway (Hwy. 62) and immediately saw a café and service station. Holgie said, “Let’s stop here, Cowboy.” We were both in need of a restroom break and a chance to stretch our legs, plus I needed to gas up the big hog. Chucks’ illustration of an astronaut on the moon, for his NASA job in the 1960s. Holgie, being a map enthusiast, pulled out her Southern California map, and while she and Phyllis discussed various points west, Mary Jane and I discussed the community at large. Mary Jane explained how in 1990 troops from the Twentynine Palms Marine Corps Air Ground Combat Center deployed en masse to the Persian Gulf in response to the Gulf War. Holgie spoke up again saying, “So how do we get in touch with this Action Council?” I’d long since discovered Holgie was quick to get to the point when it came to business. 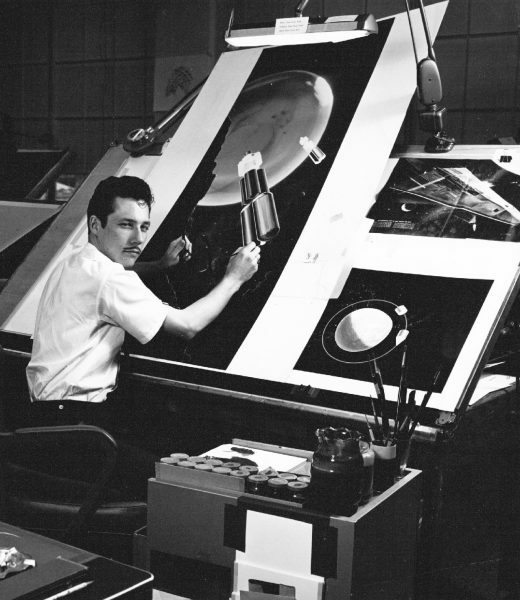 Chuck working on a Mars Probe illustration for NASA. “That’s really considerate of you,” I said, thinking what a wonderful stop this had turned out to be. While Phyllis was on her errand, I gassed up “Hoss,” then we took a pee break. A short time later we said our thank you’s and goodbyes, then with the mural program brochure tucked away in my leather jacket and a smile on my face, we left the serenity of the beautiful Hi-Desert and headed back to the bustling, noisy city of Los Angeles. By that comment I knew she wasn’t going to help me out, so I told her I’d have to think on it and get back to her later in the day. One hour later I called her back and gave her my quote. When she quickly said, “Okay, that’s fine,” I knew I’d underpriced myself. It was a big wall—a big canvas—but nevertheless, I was looking forward to yet another new creative adventure. Beth agreed to overnight the reference photos Action Council had on hand, photos of the wall, plus a one-third down payment, so I could get started right away. 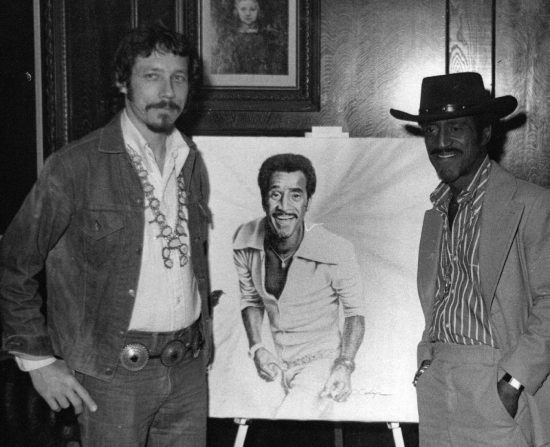 Chuck posing with his portrait of Sammy Davis, Jr.
A week later, I completed the design sketches to scale and submitted them in person. I drove to Twentynine and met with several members of Action Council. It was nice being able to put a face on Beth Wiederhold, for she seemed as sweet and intelligent as her voice had intimated. I also met Larry Briggs, a retired Marine now operating Plaza Realtors; Ray Kinsman, another retiree; Bucky Bucklin, a retired Morongo Basin Sheriff’s Dept. Public Affairs Officer, serving Action Council in a similar capacity. Bucky was slightly rotund and held a ready yarn and a friendly smile. Also during this trip to Twentynine I had the privilege of meeting Major General Les Palm, the commanding general of the Marine Corps Air Ground Combat Center (MCGACC). To my surprise, he gave me a personal tour of the base and granted access to the areas where I needed to photograph military equipment that was to be featured in the mural. This afforded me a first-hand look to go along with photos I’d been provided. General Palm was small in stature but carried with him a quiet confidence that was befitting such a leadership role. We quickly became friends. I had no sooner arrived back in Hollywood when Beth Wiederhold called to inform me the design sketches had been approved, so I quickly began work on the full-color maquette illustration. It would be used for the reproduction of signed and numbered limited edition prints created as a fund-raiser for the mural project—on sale for $125 each. Additionally, my color illustration would serve as both a guide for selecting a color palette and to project on the huge wall one section at a time. Meanwhile, a new artist’s cooperative gallery was planning to open its doors in Twentynine Palms, with an artists’ reception on Saturday, Oct. 7—Gallery 5770. To my delight, I was asked to be part of some well-known names in the local art community, each of them having the same desire in common: to have a permanent retail home to show and sell their art. Anchor artists were to be Janet Braley of Real Desert Pottery; Terry Waite of Desert Iron Gallery; Ellie Tyler of Earth Images color photography; Aaron & Deb Scott of CoyoteTown Creations offering stone sculptures; Steve Hill of Wonder Valley providing desert oils; and myself, offering desert oil paintings and ceremonial peace pipes, which I’d learned to create out of Catlinite (also called pipestone). Two weeks rushed by me—“Time flies when you’re busy,” I reflected—but I’d finished the mural’s color maquette, sent it overnight to Action Council, then two days later got the approval. Next I put together a two-man team of mural assistants: my Neighborhood Watch buddy David Carlin, and David Fulkerson, a commercial artist I socialized with at Cat n’ Fiddle, a British pub on Sunset Blvd. in Hollywood. Fulkerson seemed eager to be a part of the team, and I guessed he would have good work ethics. As the time was getting near for me to start working on site, I felt much excitement and apprehension. I’d painted more than a dozen large indoor murals in my Houston days, but a 101 feet long by 18 feet high at its shortest and 28 feet high at its highest would be, by far, the largest piece I’d ever painted. I refused to feel intimidated, though, and looked forward to the adventure. The two Davids and I arrived in Twentynine somewhere around the 27th of September. Summer’s heat was still evident, holding fast like a stubborn mule. Nevertheless, the desert was beautiful—especially in the evening when the waning light seems never twice the same. The 29 Palms Inn kindly offered to put me up for the first three or four days, while the two Davids were put up in apartments downtown. I stayed in a quaint cabin near the pond of the Oasis of Mara, which was surrounded by dozens of Washingtonia filifera palms and next to a large garden, which provides much of the fruit and vegetables for the Inn’s restaurant and bar. It turned out to be a comfortable, laid-back place to stay. My room had no phone and no television. I’d been told that the Hollywood crowd often frequented the Inn, and liked the fact it was a getaway place where they could disappear for a few days and relax without being disturbed or fussed over. Also, the celebrity crowd was treated with total indifference, which added to the Inn’s getaway charm. Jane (Grunt) Smith, the owner of the Inn, was a true desert creature. Tall and somewhat big-boned, she wore a pleasant smile on her desert-tanned face. 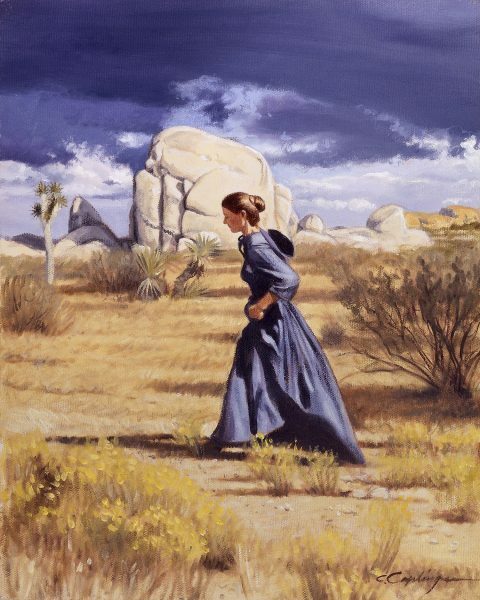 She wore no makeup and dressed in simple desert-appropriate attire. The big mural wall became much bigger on the first day of work, and I realized I’d bit off a big chunk. However, throughout the next few days of sketching and projecting, we made good headway and I felt much better. I’d allowed myself and my team only fifteen days to paint the mural—an insanely difficult schedule—so I knew I’d have to stylize the mural. 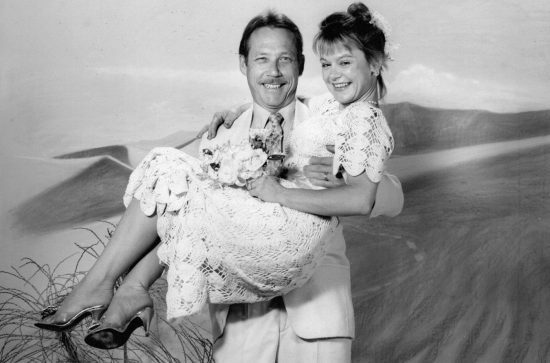 David Carlin stayed for one week, then returned to Hollywood, but Fulkerson stayed with me until completion. The heat, at times, reached 108 degrees on the south-facing mural wall, but we rigged a shade cloth onto the scaffolding, which gave us some relief. One day at about quitting time, Bucky Bucklin pulled up in a station wagon, opened its rear door, pulled out a card table, and proceeded to set up a white table cloth and a formal dinner table setting—silverware and crystal wine glasses! Right on the desert sand in front of the mural! How neat that was! Both my reception/presentation at the 29 Palms Art Gallery on October 6 and the artist reception the following day at Gallery 5770 went really well—a good turnout for both days, with 300 or more at 5770. The 29 Palms Art Gallery had been a longtime establishment dating back to the Fifties. 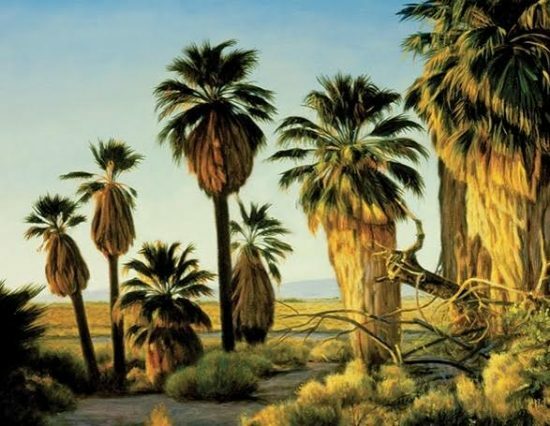 The non-profit Artists’ Guild was founded by John Hilton and a group of desert artists in 1951-52, and was frequented by members such as actor James Cagney. I was meeting more people—slowly but surely discovering who the movers and shakers were in the community. One really interesting person I met at 5770 was an elderly but colorful lady named Prudie Underhill, wife of the late Bill Underhill, founder of The Desert Trail newspaper. I learned from Prudie that the gallery originally house The Desert Trail and was built by Mr. Underhill in 1937. We completed the mural several days before the unveiling date, so I rushed back to Hollywood, rested a day, then Holgie and I returned and checked into a motel, ready for the big unveiling. By this time, I’d been spoiled rotten by the community, and with a nervousness in my step, I nevertheless looked forward to the ceremony. David Fulkerson was also to attend, and I insisted he sit at the dais next to me, for he had been a tremendous help. On Thursday, October 15, Holgie and I arrived at the mural wall to find Adobe Road had been blocked off for several blocks, so we entered the area via back streets. We were pleased to see the Marine Corps Air Ground Combat Center Band playing patriotic tunes, while volunteers handed out yellow ribbons similar to those Americans across the country wore to support the half million troops who saw duty in the Persian Gulf. As promised, the entire mural surface had been covered by sewn-together sheets—waiting for the signaled time to be lifted—the “unveil.” The area quickly became crowded and people excitedly milled around static military equipment displays manned by the Marines of 2nd Platoon, Delta Co., 3rd Light Armored Reconnaissance Battalion, and Tow Platoon, Headquarters Co., 7th Marine Regiment, both stationed aboard the base. After a Marine Color Guard came forward with the U.S. and Marine Corps flags, hearts were quickly covered and hands went to foreheads as the band played, “The Star Spangled Banner.” Next, Navy Captain James Nickols, the Combat Center’s senior chaplain, gave an invocation that included three prayers. Retired Maj. Gen. John I. Hopkins was introduced, along with Brig. Gen. Emil R. “Buck” Bedard and Sgt. Maj. Charles Chamberlain, Hopkins’ base sergeant major, who also was retired. Hopkins and Bedard told wonderful stories of their time serving our country. At this point in the evening, things started to become surreal to me. Maybe “magical” is not too strong a word to describe how I felt. Looking around, I could see hundreds of people crowded around the immediate area and hundreds more out into the sidewalks and street. I was somewhat overwhelmed. I looked over at General Palm beside me, calm and poised—then, at the rest of the dais—the proud military stalwarts, the flags, the military equipment; the warm night air, the awareness of the mural lights above and behind us—people became a blur—it was the same feeling I’d experienced when I stood next to NASA’s Dr. Wernher von Braun in a concrete bunker awaiting the full-endurance static testing of all five engines of the giant Saturn V booster rocket—I felt like a fly on the wall, observing everything around me as if in an out-of-body experience—like you’re there, but you’re mostly an observer—watching. I knew I was to speak a few words at the microphone soon, so I quickly shifted back to the moment at hand. Then something wonderful happened … wonderful and funny, when a shaggy dog suddenly lunged from the observing crowd and dived playfully into the sand not four feet in front of the speaker. Almost immediately, a small boy dived after his dog, and they both rolled in the sand—the boy laughing—but no one seemed to notice. I mean no one! That was the exact moment I realized I’d fallen in love with the community. I mean, this was straight outta “Mayberry”! I thought, “I really belong here….” Then I heard my name introduced. There was clapping, whistles, and cheers. I started my prepared speech by thanking both the Action Council for 29 Palms, Inc., and the owners of the Napa Auto Parts building, on which the mural was painted. Then I recalled some old memories—“proud memories,” I said. “In the 1960s when I was an art director/illustrator at NASA’s George Marshall Space Flight Center, working for director Wernher von Braun’s lab—all those who worked there knew we were involved in something special. I feel that same pride tonight! My hat’s off to our military and to this city of brave visionaries.” Cheers went up from the audience. Next, with a “This bow’s for you,” Mara Cantelo a local native who spearheaded a campaign in which volunteers tied huge yellow ribbons to 4,000 utility poles along a 50-mile stretch from Interstate 10 to the Combat Center’s main gate, presented me with one of the 10 original ribbons remaining from the project. Master of Ceremonies Gary Daigneault of KCDZ radio recalled the scores of buses returning troops to the base after Desert Storm. “The entire downtown area of Twentynine Palms was literally choked with 5,000 to 7,000 people,” he remembered. Next, artists’ proofs and limited edition prints were presented to me and Napa owners Ken and Mary Lee Myers; then the couple introduced their son-in-law, Marine Staff Sgt. Lee Hatfield, who served in the Gulf with 2nd Battalion, 4th Marines from Camp Lejeune, North Carolina. The sergeant spoke of his Gulf experiences. After General Palm’s talk, Daigneault called me forward again, and the mural was unveiled to the cheers of the crowd. Holgie had been sitting in the front row of chairs that were provided for dignitaries, so I quickly summoned her to my side—then I moved to the east end of the mural where I’d stashed a kit containing a brush, a small jar of paint, water and rags. I then proceeded to sign the mural to more cheers and camera flashes. Suddenly Marine Staff Sgt. Jon Barkley stepped forward, and as the Marine Corps Band played, he belted out the words to Lee Greenwood’s “God Bless the USA.” Audience members, many of them crying, clapped and swayed as fireworks suddenly filled the air. There was much cheering, and as the band continued to play, I became inundated by people that had purchased posters of the event—most of them wanting the artist’s autograph. Needless to say, I was very humbled by the experience. I also felt honored to have had the opportunity to be part of the wonderful and historical event. That evening Holgie and I went to bed knowing we’d experienced something to be remembered for the rest of our lives. Chuck Caplinger’s studio will be open to visitors the last three weekends in October, 2017, (10am-5pm) to coincide with the Highway 62 Open Studio Art Tours. Thanks Chuck and Ann for publishing the excerpt. Chuck has paintings at Gallery 62 in Joshua Tree this month, and I picked up a copy at the 2nd Saturday Art Crawl a couple weeks ago. A very talented artist. Thanks for the posting. interesting and wow! how much this amazing country has changed in the twenty plus years since this wonderfully human story happened. thank you for sharing, dear ann.